Numerous real-life examples of people who have used this system successfully in their spare time are included. To further assist readers in acquiring the income real estate they seek, dozens of sources of funding are included. TYLER G. HICKS is a long-time real estate adviser and director of a large New York lending organization that has made millions of dollars in real estate loans. He has also written several books on real estate investing, including 209 Fast Spare-Time Ways to Build Zero Cash into 7 Figures a Year in Real Estate (Wiley), which has sold thousands of copies. Chapter 1: Get Into, and Profit From, the World’s Best Borrowed-Money Business. Chapter 2: Pick the Type of Income Real Estate You Want to Acquire. Chapter 3: 49 Mortgages That Can Give You the Real Estate Funding You Need. Chapter 4: Internet Financing of Income Real Estate Can Save You Time. Chapter 5: Private Lenders Can Be Your Real Estate Money Supply. Chapter 6: Self-Starter Real Estate Financing for Beginning Wealth Builders. Chapter 7: Bad Credit/No Credit Financing Is Possible for You. Chapter 8: Little-Known Alternative Money Sources for Real Estate Loans. Chapter 9: 100 Percent Financing Is Alive and Well Today. Chapter 10: Use Property Appreciation to Build Your Real Estate Wealth. Chapter 11: Use a Wraparound Mortgage to Acquire the Income Real Estate You Seek. 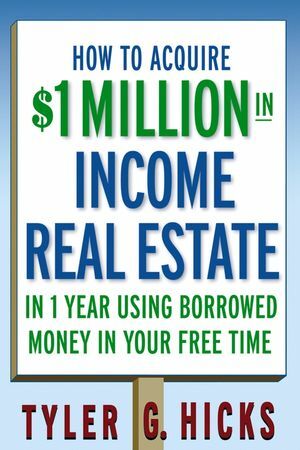 Chapter 12: Bringing It All Together—Acquiring $1 Million of Income Real Estate in One Year Using Borrowed Money in Your Free Time. Appendix: Useful Real Estate Books, Reports, Training Courses, and Newsletters for Beginning and Experienced Wealth Builders.